Home Depot reported quarterly earnings that beat Wall Street estimates for the sixth time in a row. It reported earnings per share of $US1.69, above the expected $US1.61 per share. Revenues were $US23.88 billion versus the $US23.66 billion that Wall Street was expecting. Its forecast for comparable store sales, an important metric for judging a retailer’s performance, was below Wall Street estimates. 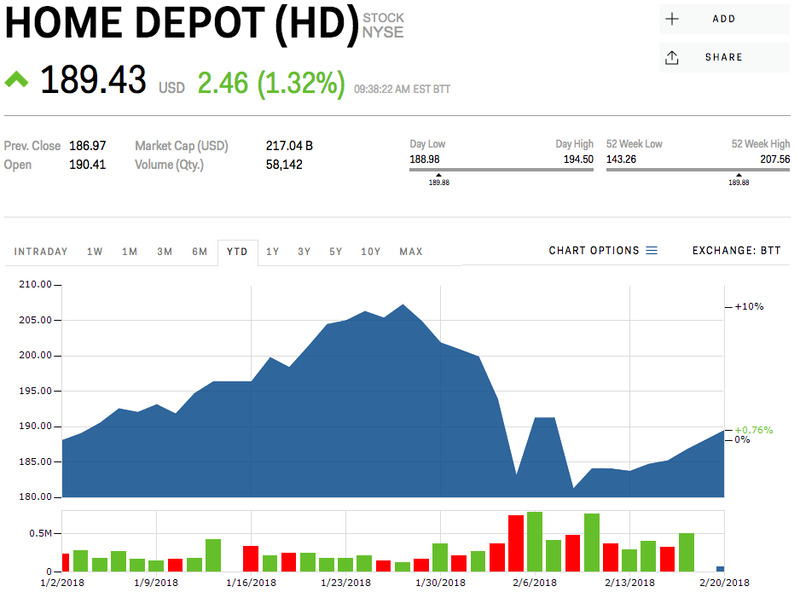 Watch Home Depot’s stock move in real time here. 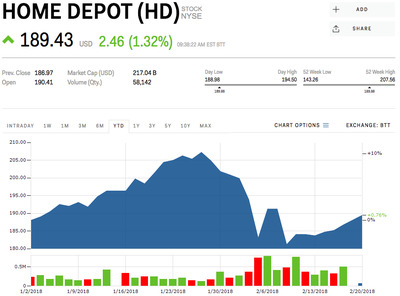 Home Depot‘s shares climbed 1.5% Monday morning after the home-improvement retailer beat Wall Street earnings estimates for the sixth consecutive quarter. Its quarterly profits were boosted by an improving housing market and shoppers who spent more on average. The company earned $US1.69 per share, above analysts’ expectations of $US1.61 per share, as revenue rose 7.5% year-over-year to $US23.88 billion. It was above estimates of $US23.66 billion. Comparable store sales, an important metric for judging a retail company’s performance over time, surged 7.2% YoY, ahead of analysts’ estimates of 6.1%. However, Home Depot offered a slightly disappointing yearly forecast for comparable sales of 5%, which was below Wall Street’s expectations of 5.4%. The company also increased its quarterly dividend to shareholders by 15.7% to $US1.03 per share. The retailer took a one-time provisional tax hit of $US127 million due to the tax reform law. The company also announced last month it was giving its hourly workers a cash bonus of up to $US1,000, which slightly impacted its diluted earnings per share by approximately $US0.17, according to Home Depot’s release. Home Depot’s stock was trading at $US189.43 per share, and was up 0.76% for the year. Read more about why Lowe’s could be just as attractive, if not more so, than its bigger rival Home Depot.